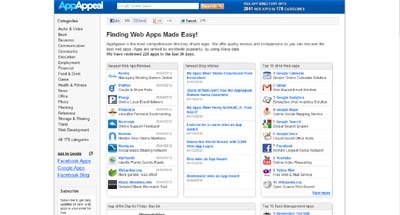 AppAppeal makes it easy to find the web app that you need. AppAppeal shows 2600+ web apps in 179 categories. You can find a reviews, screen shots, screen casts and more for every app. You can leave a comment and a rating for every web app. AppAppeal offers a worldwide popularity ranking based on Alexa data. The opinion of the public decides whether a web app is worth checking out or not. AppAppeal offers comprehensive reviews and screen shots made of the web app itself. Over 100 apps are added every month and data is updated every day.